The garden is wet and mucky today and after some intense weeding yesterday, we are letting things and ourselves rest until it dries up a little bit. Plentiful rain is an absolute blessing for our young onions, potatoes, and brassicas who are now glistening with beaded drops of water. However, this spring has been a bit challenging with the rain coming so frequently, giving us only a few windows in which it’s dry enough to till and prepare the soil. So, why shouldn’t you work in the garden when the soil is wet? Good soil structure is essential for growing healthy plants. Soil pores allow for oxygen and water to flow freely through the soil and form homes for the vast diversity of soil organisms. When you walk on, hoe, dig, or till wet soil, you are likely causing compaction, which causes these pores to collapse. So when you walk out to your garden and the soil sticks to your boots, resist the temptation to work! Instead, do what we did today: go inside, make some hot chocolate and read about organic pest management. Speaking of “pests,” do you recognize this fella? You guessed it! 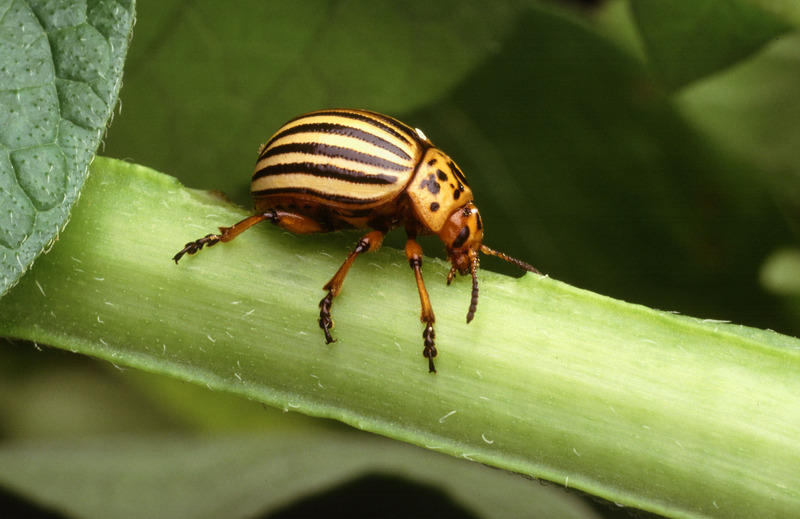 The notorious Colorado Potato Beetle. We have spotted one of these on the property but luckily they have not found our patch of potatoes that are just barely poking up through the soil. So what to do when these guys do begin to gnaw on our taters? Conventional wisdom would have us declare all-out war on them, and bring in whatever chemical insecticides necessary to eradicate the menace. But wait, these are just tiny little insects on a mission to feed themselves, have a family, and die knowing they contributed to the backyard economy. Too often we humans appropriate the lexicon of warfare when communicating our horticultural endeavors. But by doing so, we are forgetting the goal here: promote, tend to, enhance, support, and feed life, not recklessly destroy it. So, again, what to do? Well, the plan for now is to first spray Neem Oil, which is made from the Neem tree. The oil makes nomming on potato leaves less pleasurable for the beetles, so in theory they will find a more satisfying meal elsewhere. Simultaneously, we will cover the plants with a fabric that lets in light while hiding the plants from beetle invaders. The key here is timeliness: both of these strategies are preventative measures that are not very useful after the beetle has shown up, sat down to eat, and realized the tater salad is scrumptious. We have traded the role of warmonger for that of the merry prankster, the one who is tricking brother beetle into letting us eat his lunch. Still not very fair for the beetle, but at least he is not being murdered and we are not disrupting the soil food web. These kind of compassionate pranks are what let natural growers conjure nutrient-dense foods out of a mess of weeds, bugs, water, dirt, and confusion. Hope you have enjoyed this tidbit of garden minutia. We should also mention that CSA shares are still available, and please contact us if you are interested. Weekly markets start on April 25, and from then we’ll attend the Forest Farmer’s Market every week and the Grandin Village Community Market in Roanoke every other week. I like your attitude regarding pests…”We have traded the role of warmonger for that of the merry prankster.” While I have no love-loss for pests that devour my garden…I believe in intervention that will NOT cause harm to the environment. Have you tried ‘importing’ a few praying mantis’ to help keep the pests at bay? That makes a lot of sense about soil compaction. I usually just think of tractors causing compaction.